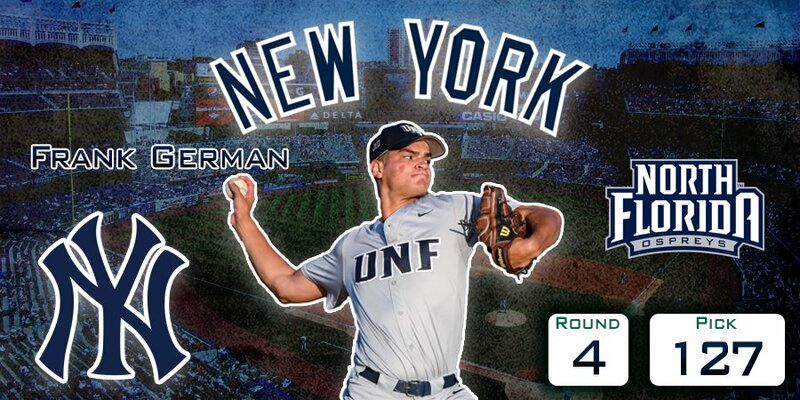 The New York Yankees started Day Two of the 2018 MLB Draft by taking a right-handed starting pitcher out of the University of North Florida. His name is Frank German and he was the 127th overall pick in the draft, let’s meet him. This is Meet a Prospect: The Frank German Edition. German was a junior at the University of North Florida at the time of his drafting and stands at 6’2” and weighs in at 195 lbs. German is a right-handed starter and is also a two-time Atlantic Sun Conference First-Team player who possess a mid-90 MPH fastball, an above average breaking ball, and a circle change that he uses to keep batters off balance. This season for the University of North Florida the right-hander posted an 8-3 record with a 1.58 ERA. German had 11 starts where he allowed one earned run or fewer while he also posted three starts where he did not allow a run at all. “NORTH FLORIDA HAS NEVER HAD A PITCHER TAKEN IN THE TOP FIVE ROUNDS OF THE DRAFT, WITH ONLY OUTFIELDERS TODD DUNN AND DONNIE DEWEES GOING THAT EARLY. GERMAN, WHO BEGAN THE YEAR AS THE OSPREYS’ TUESDAY STARTER BUT WORKED HIS WAY TO BEING THEIR FRIDAY NIGHT ACE EN ROUTE TO BEING A GOLDEN SPIKES AWARD SEMIFINALIST, HAS THE CHANCE TO BECOME THE FIRST. GERMAN HAS A SOLID THREE-PITCH MIX THAT POINTS TO A FUTURE AS A STARTING PITCHER AT THE NEXT LEVEL. HE’LL THROW HIS FASTBALL IN THE 90-94 MPH RANGE AND MAINTAINS HIS VELOCITY, ABLE TO REACH BACK FOR THAT 94 LATE IN STARTS WHEN HE NEEDS IT. HIS BREAKING BALL IS CLOSE TO A 12-TO-6 CURVE WITH LATE AND SHARP BREAK TO IT AND HE THROWS AN EFFECTIVE MID-80S CIRCLE CHANGE THAT HAS THE BOTTOM FALL OUT OF IT. HE COMMANDS ALL THREE PITCHES WELL AND HAS THROWN A LOT MORE STRIKES, WHILE MISSING MORE BATS, THIS YEAR COMPARED TO HIS SOPHOMORE SEASON. German has already signed with the Yankees and can be followed on Twitter by following @fgswift. You can also follow us on Twitter by following @GreedyStripes. Frank, welcome to the organization and also, welcome to the Yankees family. You are an experienced right-handed starter that should fly through the Minor Leagues. We are all watching, and we are all rooting for you! !